If you enjoy escaping the demands of life by heading into nature, you will love the beauty and utility of a Bunkie. 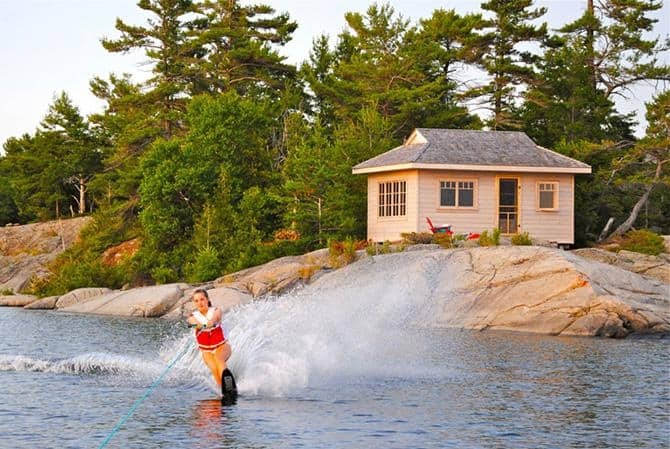 The innovative Bunkie is a small, yet fully functional cottage or cabin that you can place nearly anywhere. As a completely customizable building, this structure will transform your nature retreat into a place you always look forward to visiting. 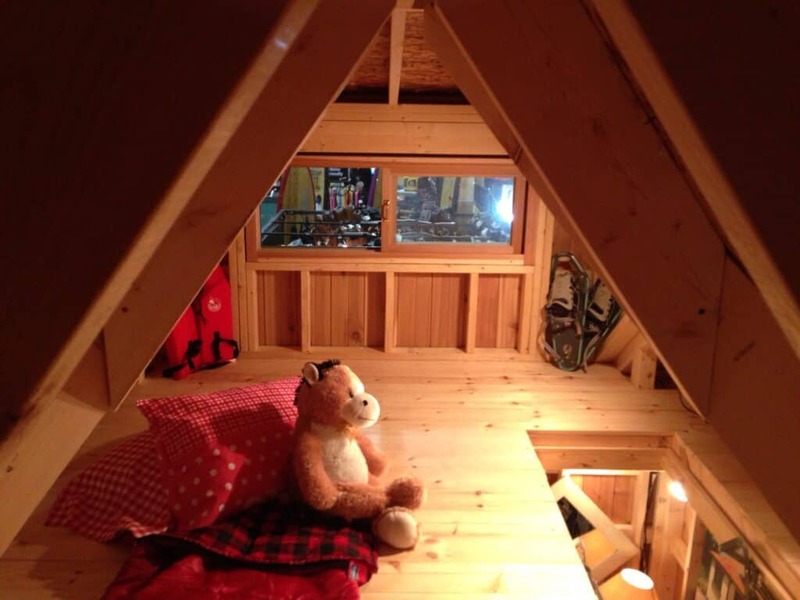 The Bunkie offers an immense number of unique features that turn a simple cottage space into a relaxing, comfortable home away from home. The style elements and layout features that come with your Bunkie depend on the build style you select. The majority of the following key features are included in the basic layout for this iconic structure. Each cabin design is made from western red cedar, which often ranges from rich yellow to deep red tones. You can further personalize the look of exterior surface by applying stain or paint. Stain accentuates the natural tones and grain of the wood, while paint completely alters the color and finish. You can also add alternate design features, such as a tall porch or planter boxes, to complete your personalized exterior layout. You can design and furnish the interior space any way you like. You can fit bunk beds or simply go with a pull-out sofa to maximize your floor space. You may add shelves, racks and drawers all throughout the space for additional convenient storage options. You can select curtains or blinds to go over the windows or leave them bare to allow more natural light into the dwelling. The space is fully customizable to give you ample decoration options. The 10×10 Glen Echo Bunkie features 100 square feet downstairs with an approximately 130 square feet loft upstairs. Due to the floor space and height increasing dormers, the loft can accommodate a large queen size bed with room to walk around. Additional shelving can go in the loft as well for storing blankets, clothes and other personal items. You can also use a fold-away ladder to access the loft space to keep the walkways through the main floor clear. French doors on your Bunkie allow you to remain in close proximity to nature throughout your entire trip as they open up the building. The fresh air will help keep the space feeling fresh and airy. The French doors also provide the building with a sophisticated look and feel. If you prefer, you also have the ability to replace the French doors with a single door and two screened windows. Across the rest of the Bunkie walls, you will find slide-open screened windows that let in natural light. When closed, the windows are highly insulated to keep the outdoor weather from causing unwanted temperature fluctuations inside the cabin. The screens allow you to let in fresh air without allowing mosquitos and other insects into your dwelling. When you are ready to obtain a Bunkie to perfect your nature retreat spot, contact us at Summerwood to discuss your options. You can choose from nearly one dozen fully customizable cottage or cabin styles. Each of the style options can be delivered as a pre-assembled or pre-cut kit. If you prefer, you can use the provided labor quote to obtain an estimate from your contractor for professional assembly at your desired location. Either way, as a building with a small footprint, many municipalities do not require that you secure a permit before erecting this structure at your chosen location. Building permits are typically only required for buildings over 100 square feet, which is far larger than a typical Bunkie layout. Summerwood produces high quality structures designed to increase the aesthetics, utility and value of your properties. When you are ready to proceed with this project, you can view and design your Bunkie at the Summerwood website or call 1-866-519-4634 to discuss your order. You can also inquire about the available pre-fab sheds, playhouses, pool houses and garages to complete your outdoor project needs. There is nothing like rolling out a sleeping bag and hopping in to sleep directly under the stars. Your kids will love watching for shooting stars and following the lightning bug trails as they dart across the dark sky. Since you will need to turn off all exterior lights for the best view of the night sky, make sure to give your kids their own flashlights to use as needed. In case of light rain, let your kids know they are free to retreat under the garden trellis to stay dry or simply come back inside the house and try the sleepover another night. As you develop trust in your child’s ability to make safe, smart decisions, do not feel bad about peeking out the window occasionally to verify their safety. A Bunkie playhouse gives kids a chance to foster their independence in style. The Bunkie structure mimics the appearance and atmosphere of a home while remaining distinctly separate from the household. If you are not quite ready to let go of the reins, you can rest assured knowing the Bunkie doors and windows feature secure locks. The single room structure has enough room for board games, truth or dare, snack sessions and sleeping bags for everyone in attendance. Have your kids lend a hand in finding and hanging decorative elements to make the space feel like their very own. You can transform your kids’ trampoline into a raised tent with a purpose built cover. Look for tent covers that feature plastic skylight inserts in the ceiling for a clear view of the stars. The zip door can remain open until all of the kids are ready to cease playing in the yard and pile into the tent to rest. The trampoline keeps kids comfortable without additional padding, while the enclosure keeps everyone feeling safe and secure. Before you leave them to their own devices, remind kids to be mindful of the springs and refrain from jumping inside the tent. If you prefer a multi-purpose structure over a dedicated sleepover Bunkie, choose an enclosed gazebo instead. Custom gazebos dramatically dress up your property’s appearance and provide a place for everyone to spend time together. The gazebo offers the same promise of comfort and safety for your kids and their friends sleeping overnight in the backyard. When not in use, you can invite your own friends and family over to play cards or enjoy a meal underneath the protective, gorgeous gazebo structure. Take your children’s backyard sleepovers to new heights with Summerwood’s high quality pre-fab outdoor designs. A garden trellis, gazebo or playhouse bunk will not only provide kids with a safe place to sleep, they will also accentuate the look and feel of your property. You may end up adoring your structures so much that you search for a reason to enjoy your own backyard activities, such as garden parties and friendly cookouts. Contact Summerwood today to select and order the structures you want for your property. The team will assist you in designing the perfect pre-fabricated kit for the solution of your choice. You can either construct the structure yourself using the supplied directions or receive help finding a qualified contractor to handle the task—and we’ll help you all along the way.